Uncover the truth behind a mysterious disappearance! 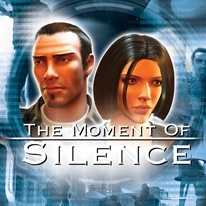 The Moment of Silence is a classic point-and-click 3rd person adventure game set in New York City in 2044. Players step into the role of Peter Wright, an advertising executive currently heading up the Government's 'Freedom of Speech' campaign. When a heavily armed SWAT team storms his neighbor's apartment, Peter must uncover the truth behind his mysterious disappearance as he becomes drawn into the deceptive worlds of corruption and power. Fascinating, well researched visions of the near future 75 locations, designed by award-winning CG artists and more than 500 interactive screens 30 minutes of full screen video Lip synchronization using phonetic voice analysis Motion captured animation.